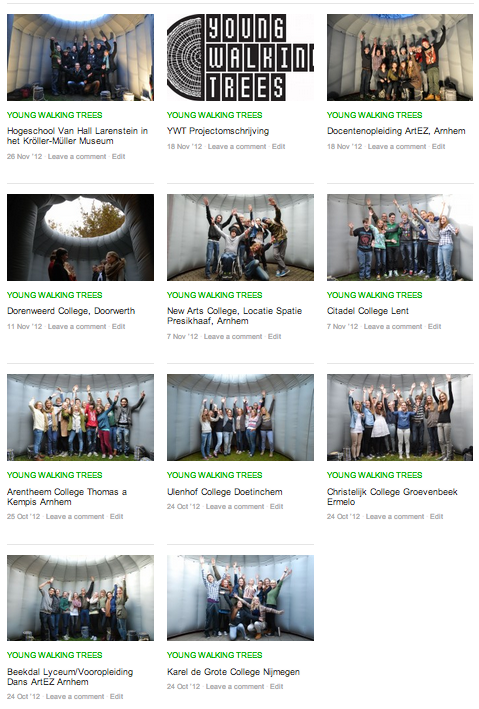 This is the link to the website of the Project: Young Walking Trees. A project for young people between 16-20 years about performance art. Ten different groups, ten workshops days in which the young people investigated their personal theme’s important for them in their lives. Each person made his or her own performance. The performances are published on the website www.walkingtrees.nl, YouTube and can be seen in a special installation in an exhibition in the Museum of Modern Art in Arnhem. Opening at april 6th 2013. Op initiatief van en mogelijk gemaakt door de PROVINCIE GELDERLAND. In samenwerking met EDU-ART. Productie Stichting NUTUUR. Dank aan: Gabrielle de Nijs-Bik, Tjeerd Kootstra, Karin Hofman, Kim Lokers, Femke Hogenbosch, en de vele vele anderen van de scholen, musea en organisaties die meewerken! Also on facebook: young walking trees.